It's time for a new sketch challenge over at the MFT Challenge & Inspiration blog (WSC 343)! I used an adorable leopard image from the Lovable Leopards stamp set for my focal point. I framed him with a Single Stitch Line Oval Frame and added two birds instead of the tiny circle elements in the sketch. Head on over to the MFT Challenge & Inspiration blog for the challenge details and for more inspiration from the DT. Hope you'll play along with us this week for your chance to win a prize! It's time to shop! MFT July Card Kit, All Smiles is available for purchase now! I have one more card to share with you that I made using the kit. For this card I was inspired by THIS photo of beautiful decorated cookies I found on Pinterest. I white embossed the Lace Background on Blue Breeze CS to create my background panel. It was trimmed and matted with a Blue Yonder panel and adhered to the card base. I first stamped the flowers with Peach Bellini ink, then overlaid a little Coral Crush ink only to the center of the flowers using my Mini MISTI. After I stamped the leaves with Blueberry ink, I cut them out with the matching dies and added some details with a white gel pen. I die cut the "Smile" three times from Safety Orange CS and glued them together for thickness. It's Day 2 of the MFT July Card Kit Countdown. The All Smiles Card Kit will be available for purchase TONIGHT at 9:00 pm EDT! Today I combined the kit with the Bold Stripes Cover-Up Die-namics. First I stamped the flowers from the Plentiful Petals stamp set onto a piece of Smooth White CS with Lemon Chiffon, Lemon Drop, and Peach Bellini inks. Then I cut it with the Bold Stripes Cover-Up Die-namics. I cut three more Bold Stripes Cover-Ups from Smooth White CS, layered them onto a Smooth White card base, and adhered the stamped one on top. I inlaid the stamped cut-out pieces and stamped a sentiment from the All Smiles stamp set onto one of them. I adhered the "Smile" cut from Kraft CS and added several sequins to finish off the card. 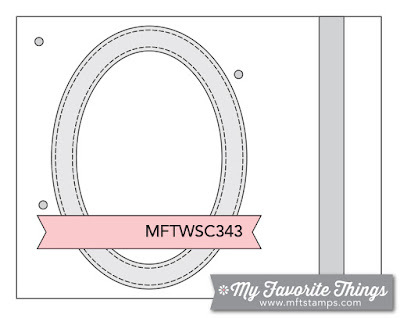 It's time to begin the countdown to the MFT July Card Kit Release! The new kit is called All Smiles, and it will be available for purchase on July 25th at 9:00 pm EDT in the MFT store. Make sure you stop by the MFT blog today and tomorrow for the full reveal of the kit and for more inspiration from the DT. I have twin cards to share with you today. I borrowed this idea from Jeniffer Mcguier's fantastic technique. I thought that the pretty flowers in the Plentiful Petals stamp set and the Double the Smiles Die-namics would go well with this technique. I stamped the flowers onto the Smooth White and Tickled Pink panels with the help of my Mini MISTI. (The ink colors I used are listed at the bottom of this blog post.) Then I die cut out the "SMILE" from both panels and swapped them each other. I layered three more die cut letters underneath the stamped letters to pop up the stamped words. 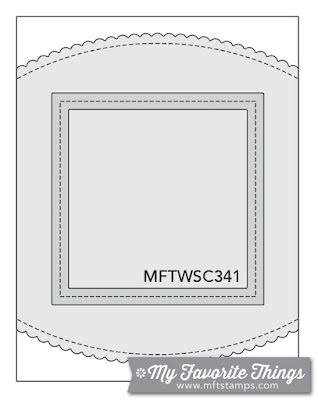 Head on over to the MFT blog to see what the All Smiles Card Kit contains and what the other DT members have come up with for today! 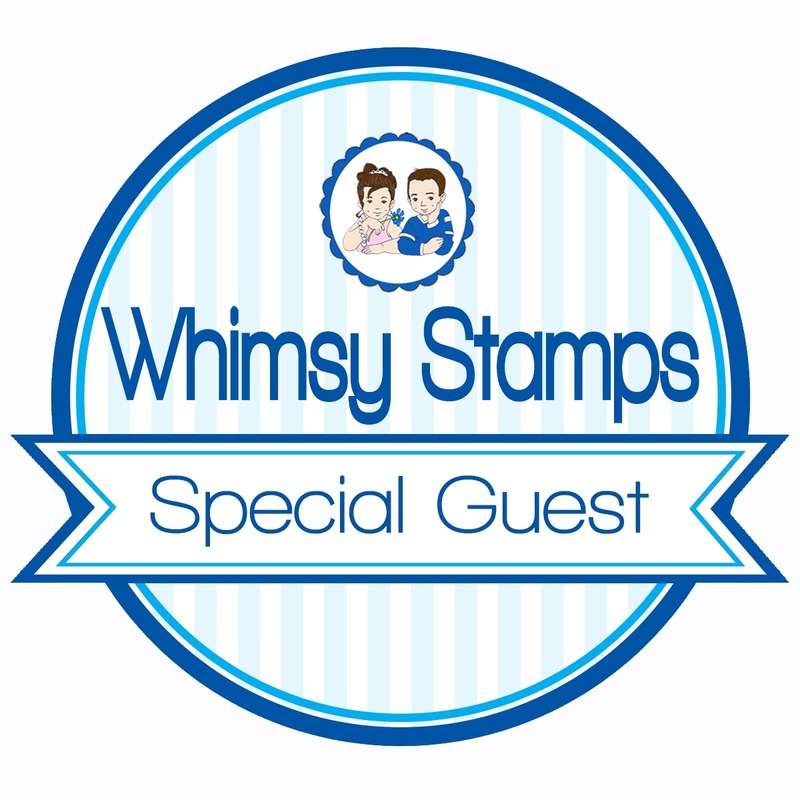 This is my second post as a special guest designer for Whimsy Stamps. This time I played with the Squirrel with Flower rubber stamp and the You Are stamp set. I had so much fun coloring this sweet image! I stamped the image with Tea Dye Distress Ink and colored it with my Copic Markers. After I finished coloring, I masked the image and applied some blue ink using a mini ink blending tool. I also added some ink blotches with a watercolor brush. I trimmed the stamped panel and adhered to the card base along with a panel of patterned paper. The bottom edges were rounded with a corner chomper. I white embossed the sentiment onto tan card stock, cut it out with an oval die, and added a couple of enamel dots. 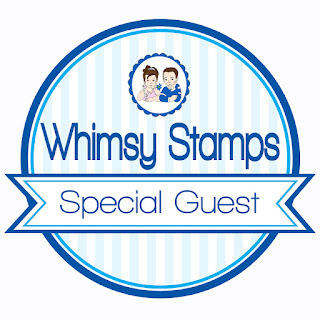 Whimsy Stamps has a variety of clear stamps, rubber stamps, digital stamps, and craft supplies. Check out their fabulous products HERE! Before I wrap up my guesting post, I'd like to say a big thank you to Whimsy Stamps for giving me this opportunity to play with their sweet & fun stamps. I really enjoyed them!! It's time for this month's MFT Creative Construction with Blueprints Challenge! There is an exciting change on this challenge. It has been moved from the MFT blog to the MFT Challenge & Inspiration blog and it's open to anyone who wants to participate, just like MFT Wednesday Sketch Challenges and Color Challenges. So you have another chance to win a $50 gift voucher!! This month we are challenged to share an idea for gift card packaging. I made a set of three gift card holders using the Blueprints 32 Die-namics and the Hog Heaven stamp set. Cut a piece of card stock to 3" x 8-1/2". Score and fold at 1-4/1" and 5" on the long side. Die cut a notched flap on the smaller flap. Adhere a white panel to the inside if you'd like to write a message. Embellish the main flap as you like. I also used the frame die and the small heart die from the Blueprints 32 Die-namics to embellish the main flap. Head on over to the MFT Challenge & Inspiration blog for the challenge details and for more inspiration from the DT. I hope you'll play along with us for your chance to win a prize! I'd like to share a flap fold birthday card with you today. I used the Happy Hippos stamp set and the Handwritten Happiness stamp set from the new release, and combined them with the Flop Card - Circle Die-namics. I made my flap fold card base using the Flop Card - Circle Die-namics, added a scallop border cut from patterned paper along the bottom edge of the front, and embellished it with the images from the Happy Hippos stamp set. I stamped a sentiment from the Handwritten Happiness stamp set onto a stitched circle panel cut with a die from the Flop Card - Circle Die-namics. (Perfect size!) I matted it with an Orange Fizz panel and attached to the inside flap. Head on over to the MFT blog for more fabulous inspiration from the DT! I created a birthday party scene in the square frame using the Happy Hippos stamp set. For the background of the scene, I inked the bottom half of a Tickled Pink panel with Tickled Pink ink and added some ink spatters with white and Coral Crush inks. The little banners were added to balance the layout. The sentiment was white embossed on a Coral Crush panel cut with the Stitched Sentiment Strips Die-namics, and I dabbed a little Coral Crush ink around the edges to make it pop up. The patterned paper is from the new Isty Bitsy Polka Dots Pastels Paper Pack. 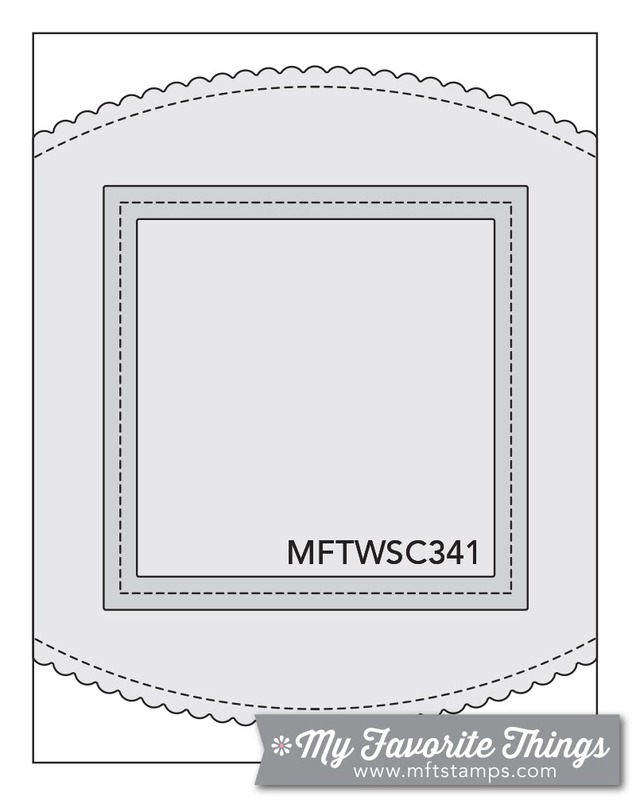 The Stitched Scallop Basic Edges Die-namics was used to cut the top and bottom edges. Head on over to the MFT Challenge & Inspiration blog for the challenge details and for more inspiration from the DT. I hope you'll play along with us this week. It's time to shop! 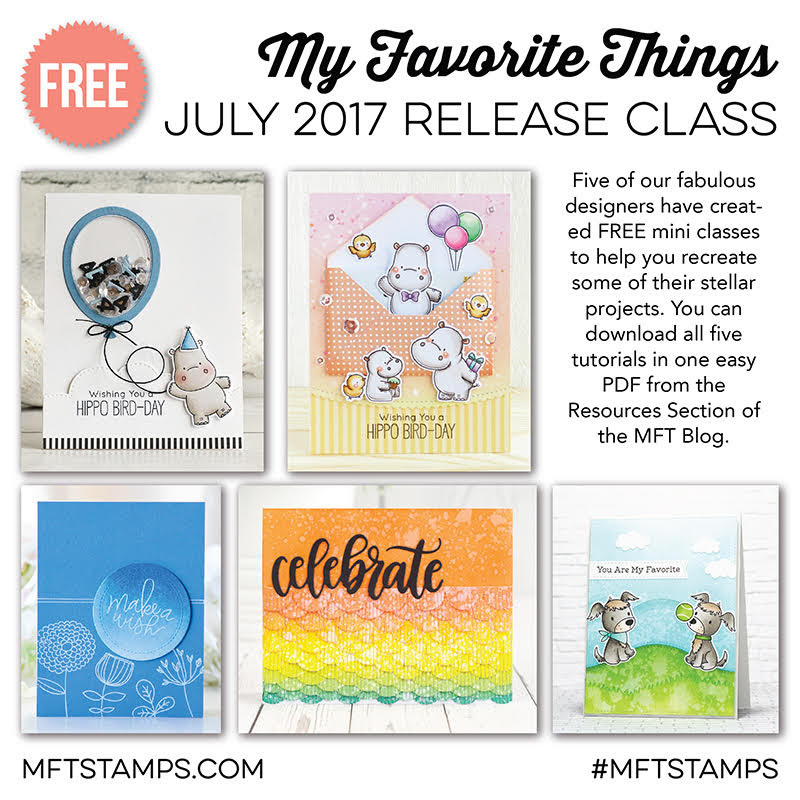 MFT July Release is live now!! I'd like to share a card with you that I made for this month's Release Class. I combined the new Happy Hippos stamp set with the Gift Card Envelope Die-namics and used a die-cut hippo to create a tab to pull out a gift card. You can see the tutorial on how to make this card in a downloadable PDF for free that is available HERE, or watch the tutorial video where Stephanie recreates this card on the MFT YouTube Channel. It's final day of the MFT July Release Countdown. The new products that we have been showcasing this past five days will be available for purchase at 9:00 pm EDT TONIGHT!! My card for today features the Celebrate Die-namics and the Star Shaker Window & Frame Die-namics along with the Star Shaker Pouches. I cut a panel from Black Licorice CS, stamped it with the Framework Background using Versa Mark ink, and heat embossed it with Black Sparkle Embossing Powder. It's hard to see in the photo above, but Black Sparkle Embossing Powder adds subtle but extra shine and festive feel. Love it! I put some gold and blue sequins, covered them with a Star Shaker Pouch, and added a frame cut from striped paper with the Star Shaker Window & Frame Die-namics. I die-cut four "Celebrate"s from watercolor paper and inked one of them with some blue Distress Inks. (The colors I used are listed below.) I glued them together and adhered to the panel.